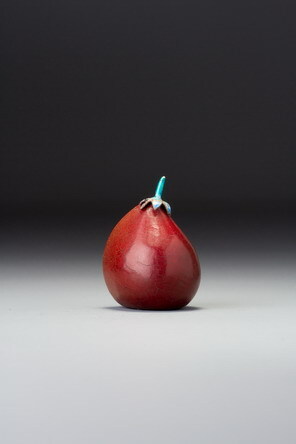 This puzzling, unique material for the snuff-bottle world may be a lacquered nut. It may even be entirely artificial and just formed like a nut. We were advised by experts from the Natural History Museum in London that it might be a type of palm nut known as Phytelephas macrocarpa, a species from South America. We were also advised that the flattened ‘foot’ area was probably artificial, as they knew of no nut that was naturally this shape. It is possible that a plant from South America should find its way to China during the Qing dynasty—large quantities of snuff certainly did—but for the time being we prefer to leave the question of the original material open. We can only state that we know of no other similar material used as a snuff bottle. A unique, entirely undecorated snuff bottle is almost impossible to accurately date. Although we can be certain that this material is not of great antiquity, it could have been made at any time during the Qing dynasty. All that has been done to convert it into a snuff bottle is the removal of any inner material it may have had, perhaps the flattening of a foot area somehow, and the addition of a coating of shellac on the outside and black pigment on the inside. None of these processes indicates any particular period. 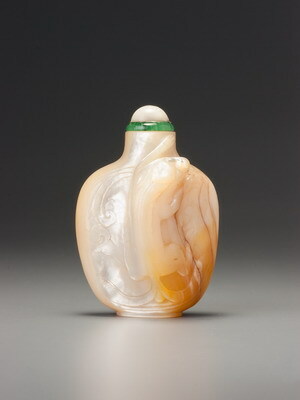 We may assume that it is more likely to date from the mid- or late-Qing period, simply because that seems to be the period of so many other fruit, fruit-stone, or nut bottles that we can date (from associated mounts, inscriptions, and so on). The surface patina seems to suggest some age, as does the even crackling that covers all the exterior surfaces. We also find parallels with the interior colouring for organic substances in the mid-Qing period (Sale 3, lot 10, for instance), but this is hardly conclusive. We have left a broader range in case we are wrong, but a date from the nineteenth century would probably be the safest bet.